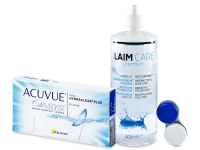 This special value package contains Acuvue Oasys lenses, Laim-Care solution, and a contact lens case. Acuvue Oasys lenses are made from silicone-hydrogel material and offer exceptionally high oxygen permeability. Acuvue Oasys are designed by Johnson and Johnson to ensure comfort and clear vision under even the most demanding conditions. Thanks to their silicone-hydrogel material (Sanofilcon A), the lenses also provide exceptionally high oxygen permeability for maximum breathability. The brand's patented Hydraclear Plus technology keeps the lenses sufficiently moisturised throughout the wearing period while resisting the formation of deposits.